The preseason is over for the Toronto Raptors, and they finished it in style. DeMar DeRozan scored 15 points, Jonas Valanciunas added 13, and Toronto beat the New York Knicks 83-80 on Friday night at the Bell Centre in the final preseason game for both teams. Carmelo Anthony had 24 points for the Knicks (3-4), and Amare Stoudemire had 11 points and six rebounds. 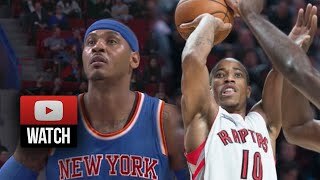 ... Carmelo Anthony Full Highlights NBA PS 2014.10.22 vs Wizards ... DeMar DeRozan vs Carmelo Anthony Full Duel Highlights Raptors vs Knicks (2014.10.24) - SICK! Carmelo Anthony Christmas Highlights vs Wizards (2014.12.25) - 34 Pts BUY NOW BoingVERT for smart athletes! 50% OFF http://goo.gl/RdgL83 Download EVE... CHART. Kobe Bryant Full Highlights vs Suns (2014.10.21) - 27 Pts, 4th Qtr Cheese!